I am writing this in a manner not to offend my Catholic friends but I feel that the remarks that Francis has made about abortion, contraception and gay marriage are damning and damaging to the church and the morality of the nation. I do not believe in Catholic doctrine, everyone knows that. I’ve kept my peace…but this time Francis has opened up a can of ‘abortion’ worms. I saw the interview this morning with Dolan and thought….I wonder how long it will take to see this on the sidewalk? Hours….only HOURS. PERCEPTION: On the sidewalk today, a 60ish year old man in a Porsche Carrera convertible stopped on a very busy street around lunch time to tell us that “The Pope said abortion is okay!” and something to the effect that we don’t have to ‘do this’ anymore. Porsche Guy assumed we were Catholic drones that would do anything the Pope said and now we’re off the hook. Let me be clear: Even IF I were Catholic, I would not succumb to incorrect doctrine or a bad pope….but some would. Unfortunately, we’ve heard it with our own ears. “It is not necessary to talk about these issues all the time. The dogmatic and moral teachings of the church are not all equivalent. The church’s pastoral ministry cannot be obsessed with the transmission of a disjointed multitude of doctrines to be imposed insistently…..We have to find a new balance,” the pope continued, “otherwise even the moral edifice of the church is likely to fall like a house of cards, losing the freshness and fragrance of the Gospel.” Read the rest here. Disjointed…dogmatic…not equivalent…new balance. This stinks of the same noncommittal attitude of the Gospel as Joel Osteen. I will say the one thing Francis is correct about is that the church WILL fall like a house of cards with this kind of attitude on sin. Francis also said: “We cannot insist only on issues related to abortion, gay marriage and the use of contraceptive methods. This is not possible,” he said. “The teaching of the church, for that matter, is clear and I am a son of the church, but it is not necessary to talk about these issues all the time.” I disagree…if you do not address sin, you run with papal scissors. Basic human morality and salvation is at stake ALL THE TIME. It’s bad enough that Evangelicals and Protestants waver and hide with abortion and gay marriage, and now this? Francis opened the door to the ‘drive by’ we received today. I sure hope Francis doesn’t start traveling with ‘Nuns on the Bus‘; they are the epitome of social justice while forsaking the unborn, among other things. My family are liberal Catholics that have all kinds of opinions with no action,just like the Porsche Guy. I used to be one of them. Again, let me remind everyone that the perception of what happened today on the sidewalk is a symptom, not the whole disease. In other words, the ‘perception’ is what people think they see, however what I saw today on the sidewalk is the ‘truth’ or result of what Francis said. I really wish he would be a bit more careful of what he says. Porsche boy is not in imminent danger of having his brain stem punctured and brain suctioned out. If you were on the business end of the abortion instruments, burn agents and other chemical warfare designed to kill you, you might not start an argument condoning this practice, then like the weasel he is, quickly drive off (not impressed). K’s assessment: man is likely a post-abortive father. One in 3 men is. I think you may be right about Porsche Guy. I do follow his blog but hadn’t read his post yet…thanks for posting it. The NYT just posted Letters to the Editor re this, it was very hurtful. Recall that Old Testament Prophet who was good himself, but did not make his kids behave. God had tough words for the lukewarm. Pray for him. I do not like watered down Catholicism. Never have. Never will. Words in context may help. http://www.news.va or Vatican.va or RomeReports on YouTube. Or Vatican Channel on YouTube, may provide the context you need. People are thirsting for the TRUTH. And, the TRUTH is a somebody not a something. This is how Pope Francis affected my Protestant Friend on Word Press. He needs to know how he comes across, to those who still believe in TRUTH, who is a somebody, not a something. JESUS IS DOGMA. Jesus…the One who died for all. I praise God everyday that He would sacrifice His only Son for someone like me so that I can have eternal life! Also know that unless every abortion facility closed and abortion outlawed, I will be on the sidewalk regardless of anything or anyone. 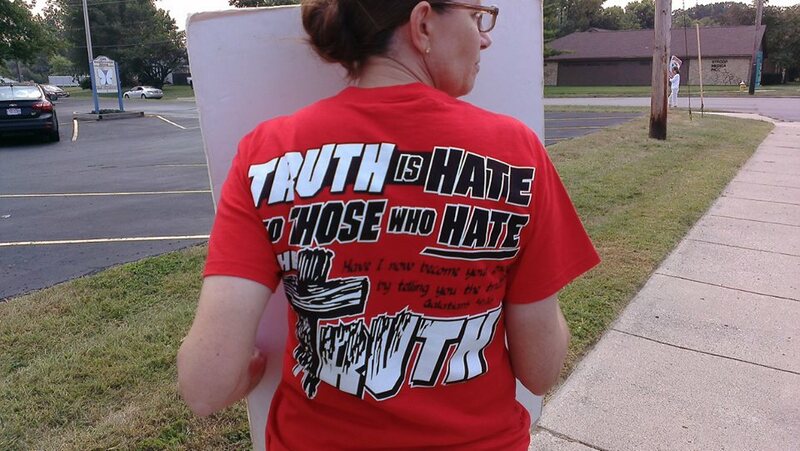 We bring the truth of Jesus Christ to the sidewalk with love and peace. The Porsche Guy is typical if a watered down message that justifies his sin.